If you are the CEO of a company selling products or services to other businesses, you undoubtedly are constantly on the lookout for new sources of growth. It’s frustrating when your company is unable to realize its fullest potential for financial success. An increasing number of companies are realizing that the last option – in particular, a transition to an as-a-Service model – is the answer to driving higher growth, more profitability, and more stable and reliable revenue streams. 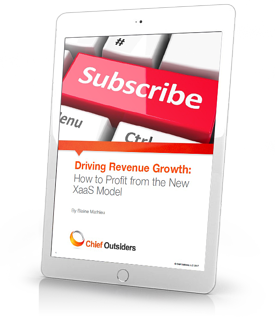 Download this eBook to find out how you can strategize for – and execute against – an evolution to an as-a-Service model.